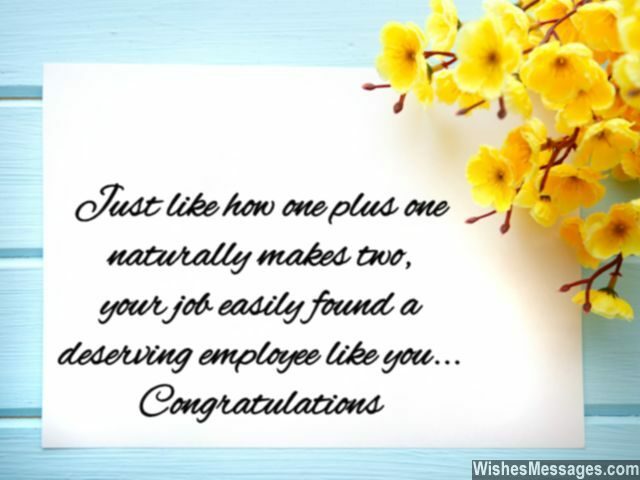 Congratulations for New Job: Congratulate a friend, colleague, co-worker, boss, brother, sister, mom, dad or anyone else who got a new job with a message that is the perfect start to a new beginning in their lives. Wish them good luck by writing inspirational and motivational quotes on a greeting card. 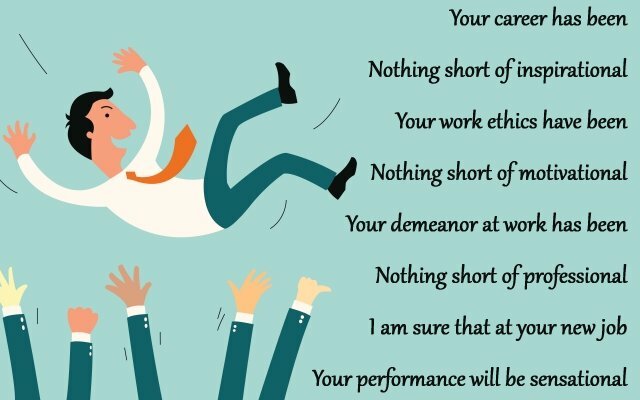 From encouraging words about working hard to funny one-liners about annoying bosses – weave your congratulatory note around the experience of changing jobs and the challenges of settling down in a new office. If you are the creative types, doodle your heart out on a piece of paper and write a few sweet words. Take a picture with your phone and post in on Facebook and Pinterset if an elaborate handwritten note sounds a bit too formal. 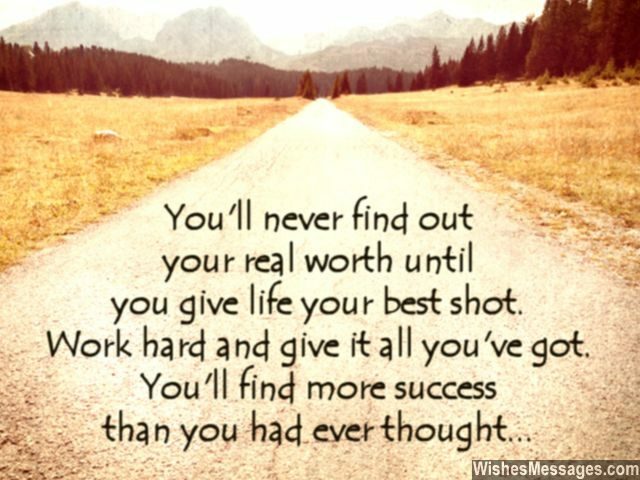 1) You will never find out your real worth until you give life your best shot. Work hard and give it all you’ve got. You will find more success than you had ever thought. Congratulations for your new job. 2) Always remember that it wasn’t destiny that got you a new job. It was your courage and desire to make your own destiny that pushed you forward. Congratulations. 3) Luck has a funny way of coming into people’s life. It follows hard working people wherever they go and does a no show for all the slackers. Congratulations for your new job, you deserved to be the lucky one. 4) In life you must always celebrate happy endings and new beginnings. Cheers to a gracious end at your old job and a promising beginning at your new one. Congratulations. 5) I can imagine you sitting pretty in your new cubicle, with your assistant taking your calls while big decisions make you mull. Congratulations. 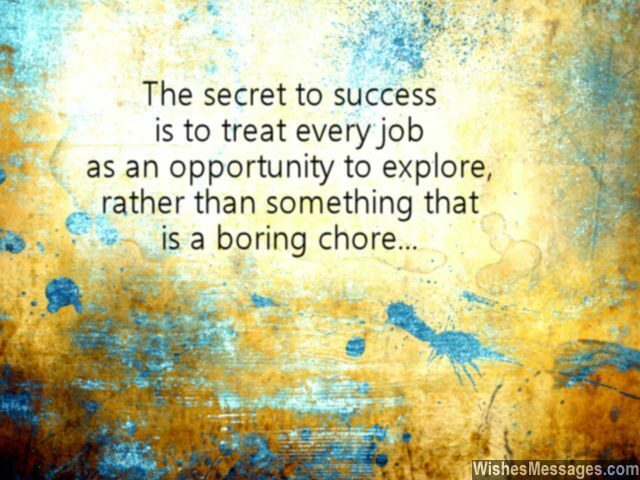 6) The secret to success is to treat any job as an opportunity to explore, rather than something that is a boring chore. Congratulations. 7) Everyone works to pay the bills and live a happy life, but very few people like you live to work at a job that gives them happiness. Congratulations on your new role. 8) Life is all about grabbing opportunities by the collar and squeezing them out till the very last drop. Make sure you do the same with your new job. Congratulations. 9) You can never guarantee what will happen in the future, but the least you can do is learn from your failures. You can never be too sure of unforeseen circumstances, but you can always be prepared to better your chances. Congratulations for your new job. 10) A better job and a better pay, your destiny has finally showed you the way. A new job is not just about perfect timing, it is about celebrating a wonderful new beginning. Congratulations. 11) Always take a firm stance, never leave anything to chance. Always deliver what you promise, never do anything remiss. 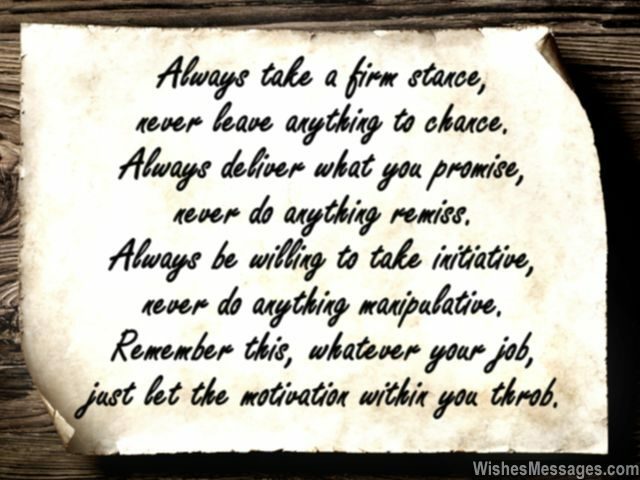 Always be willing to take initiative, never do anything manipulative. Remember this, whatever your job, just let the motivation within you throb. Congratulations. 12) Life has given you new challenges and a new opportunities… it is time to surge ahead, leave behind the slackers and the dummies. Go for it. 13) By losing you, your previous employer suffered a big loss. By gaining you, a fantastic discovery has been made by your new boss. Congratulations for you new job. 14) A few words of wisdom as you begin your new job – there are two types of employees. One, who always do what other people tell them to. Second, who always do what their hearts tell them to. No prizes for guessing which ones are more successful. 15) You can never predict how your new job will turn out to be, but you can always work hard to make sure you get what is in your destiny. Congratulations. 16) Just like one plus one naturally makes two, your new job easily found a deserving contender like you. Congratulations. 17) A new job is not just an outlet for your creativity, it is a chance for you to chart out your future and shape your destiny. Congratulations. 18) Your new job is your chance to redeem yourself of all the mistakes you made in the past. It is also an opportunity to work hard and make a great impression that lasts. Congratulations. 19) Nothing can come in-between you and your destiny, as long as you keep a positive attitude and never be grumpy. Nothing can stop you from becoming successful, as long as you work hard and don’t do something regretful. Nothing can stop you from being the star performer in your new company, as long as you do all your duties responsibly. Congratulations. 20) On the first day of your new job, you won’t just be opening a door to your new office. You will be opening the door to life’s new opportunities. Congratulations. 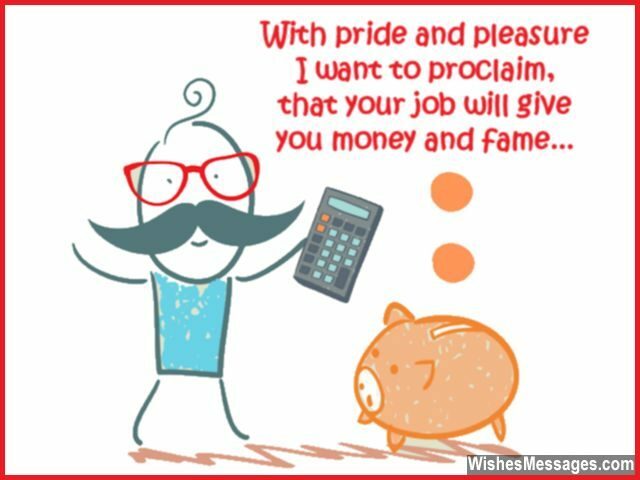 21) With pride and pleasure I want to proclaim, that your new job will give you money and fame. Congratulations. 22) You may have been lucky to get your new job, but I think that your company is much luckier to get you as a new employee. Good luck. 23) I think your new job had no option but to wait for the perfect employee to come and take it – and that is you. Congratulations. 24) Regular jobs come to those who try, try and try again. Amazing new jobs like yours come to those who work hard whether it shines or rains. In losing you, your old company has let a mistake unfold. In finding you, your new company has found gold. Congratulations. 25) A new job means more money and more money means more treats from you. Congratulations, now where’s my treat? 26) May your new job be exciting and fun, may you accomplish all that is yet to be done. 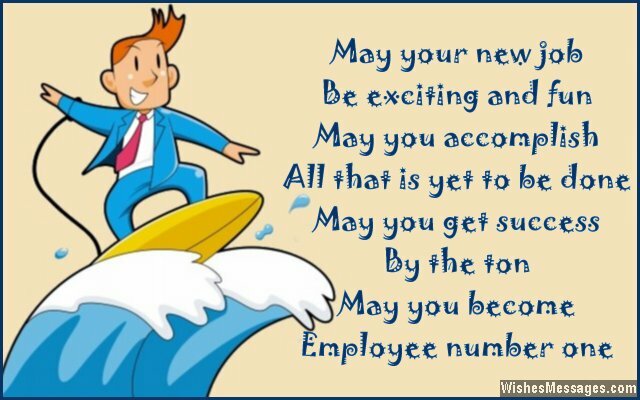 May you get success by the ton, may you become employee number one. Congratulations. 27) Congratulations for breaking up with your old job and hooking up with a new one immediately after. You are a player indeed. 28) A new job marks a fresh start to your life. While you chin up and prepare yourself to face fresh challenges, may I please remind you that there will be fresh problems too. Good luck mate. 29) Help your company boost profits, and minimize its losses. Challenge your colleagues, impress your bosses. Keep focusing on your hits, and never your misses. That is the only way, to rise above the masses. Congratulations. 30) Good jobs like yours and good people like you, are both rare and few. Congratulations to you. 31) Your career has been nothing short of inspirational. Your work ethics have been nothing short of motivational. Your demeanor at work has been nothing short of professional. I am sure that at your new job, your performance will be sensational. Congratulations. 32) Your new job is the best thing that has happened to you, because fabulous positions like these are meant for a lucky few. Congratulations. 33) With your new job your life is now set. You are going to grow leaps and bounds, I bet. Congratulations. 34) By quitting your old job you have said goodbye to irritating colleagues and a grumpy boss. But don’t forget that there may be equally annoying co-workers at your new job, whose paths you will cross. Congratulations, just stay calm and don’t let your temper go for a toss. 35) It may take time for everyone to settle down in a new job. But a helpful colleague like you will instantly be a part of the mob. Congratulations. 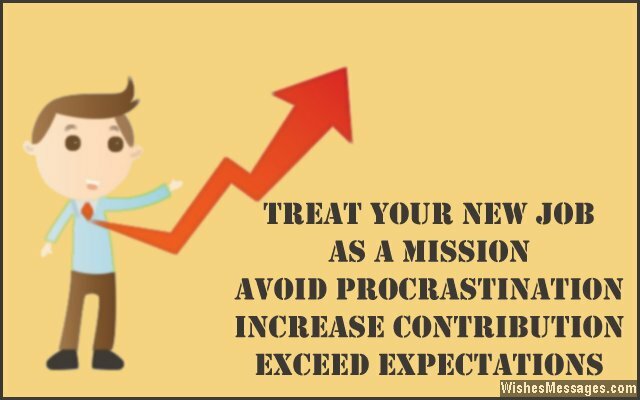 36) Treat your new job as a mission. Avoid procrastination, increase contribution and exceed expectations. Congratulations. 37) When your new employer hired you, he indirectly conveyed that you have been doing a good job in your previous job. Congratulations. 38) Congratulations for taking the leap of faith which will propel your career to new heights. 39) I am not going to wish you good luck for your new job because I know that hardworking people like you always have luck by their side. Well done and congratulations. 40) Athletes train for years and years for that one shot at the podium. Your new job is your chance to use all the years of your experience to grab a place at the top in the company charts. This is what you were dreaming about… now give it all you’ve got. Congratulations.